The Event Dome combines a sturdy structure with a flysheet featuring taped seams for increased water resistance. It can be set up in minutes and is lighter than the Event Shelter. 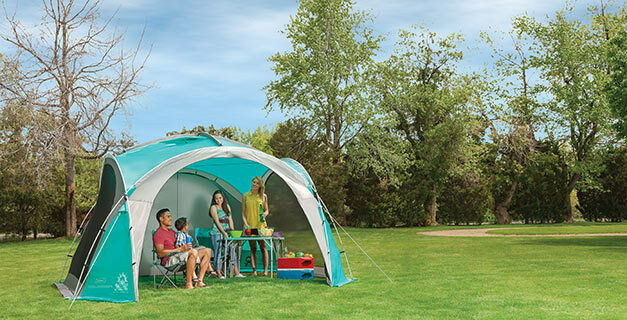 The Event Dome comes with 4 permanently attached screen walls that can be tucked into interior pockets when not needed. It also comes with 2 shade walls that are move able and removable to protect from low-angle sun whilst also blocking the wind. WeatherTec™+ is the Coleman assessment of how 'weather proof' we gauge our tents and shelters. There are many factors which influence the performance of tent in tough weather conditions. Coleman use the latest technology and a rigorous testing regime to ensure that we keep you protected at all times - whatever the weather. One key area we examine is a tent's ability to repel water. A fabric's waterproof properties are measured using a rating called hydrostatic head. If a tent has a hydrostatic head of 3000mm it means that a 3 metre column of water can be placed on its surface before any drops will show through the underside of the fabric. The areas of the tent rigorously assessed within WeatherTec™+ system include: fabrics, flysheet and ground sheet seams and zipper water tightness.